Are you listening to Your Emotions and the story they tell? Emotions are the source from which imbalances occur! We all experience Emotions. Some of them are beneficial. Some emotions give you your passion and drive, allowing you to create your dreams. Other emotions keep you locked into recurring patterns which are no longer useful to you. By bringing balance to your Emotions you are able to respond to others rather than reacting. This creates better relationships. Are you listening to Your Emotions, paying attention to those feelings of disappointment or satisfaction that keep you stuck or lead you forward? Each part of your Being is capable of holding onto emotional trauma. Both written and spoken emotions are equally powerful in how they effect your Being. Often we have forgotten the situation which created the trauma, or maybe we thought it was no longer an issue. But the residual emotions can still be in place causing havoc. So what happens with these emotions when you don’t Release them? 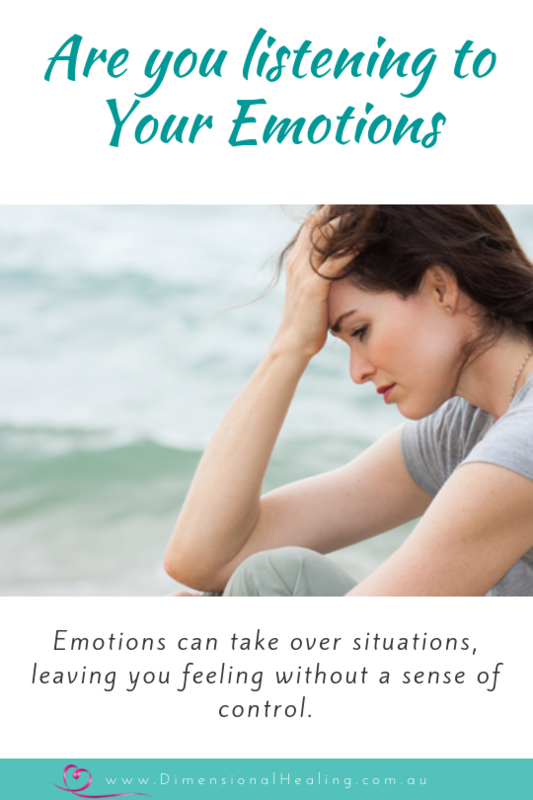 Emotions can take over situations, leaving you feeling without a sense of control. Sometimes they are suppressed or buried, surfacing as a reaction to someone or a situation. Often you don’t even know why you react that way. All can be put into two groups. Love based or fear based emotions. Love based ones lift and inspire us. Fear based feelings can be very debilitating. They diminish our self worth, can cause fatigue and physical health issues. When fear dominates, your relationships suffer, your health suffers, you may feel lost, lonely or worthless. When you live from the heart expressing your love and gratitude in life, you feel happy, inspired and worthy. You’re able to sort through challenges as they arise and feel satisfied with your solutions. As you work at releasing old traumas and feelings you will find that you experience emotions differently. They will be less explosive or sudden. They will be much milder, easier to assess and let go. You will respond to situations differently. You will feel lighter and more balanced. You will understand yourself and your needs better. Your relationships will be smoother. You will express your feelings and expectations more easily. So Tell Me – Is there some past emotional trauma stuck in your energy? Something you’ve been working on but are still struggling with? How have you been able to move forward emotionally? Very interesting thoughts I would think that finding a way to channel the fear emotions into inspiring love emotions would be a source of balance. Understanding the difference is a way to start and then focus on how we respond to the emotion instead of the emotion itself. Is that why we need to keep a positive mind and a happy heart all the time? I used to get angry or mad at something that had no sense or relationship with what actually happened. But now I know to look deeper and understand what the real issue is. Could be something from before with the same person or something completely unrelated. Delia as you say, quite often the emotional outburst has no relationship to the immediate event. When we find ourselves over reacting it’s time to have a deeper look and why we feel this way. I pondered this question a bit, Lorelle. I think some of the emotions I still have hanging around are based on business opportunities and networking opportunities that didn’t quite work out the way I had hoped. I do need to gather the learning, then clear my mind of these events. The emotions are certainly no longer serving me! I did not have a big trauma and I am grateful for that! However I remember my first “meeting” with a non venomous snake (but quite long) I was 7 and I was so shocked and afraid for myself and my dog that I could not speak for half an hour, from that moment I can’t stand even the sight of a snake on tv! Thanks Clara, I also can’t stand the sight of a snake. Fear can really immobilse us. Past Trauma that I had was when my uncle died of a heart attack, he was 33 years old, and I was the first person his wife called. So I was the first person from the family seen him laying down on the floor dead in his room. It took me about 2 years to visit his home again. Even though his wife and I had a relationship like sister, I couldn’t visit her for this long. The way I overcome this fear, and trauma was one day that I said to myself you need to visit her. It was hard the first hour, because I was remembering everything like a movie on my head. But now I am very happy that I did it, because I let go him. I can’t say I have any trauma left. I got through bullying and all the quarrels with my Mom because I got angry instead of sad. Linda Ursin recently posted…Can a pendulum show the way?